The need for preserving affordable housing is often seen as a “crisis” only in those real estate markets with extremely limited supply of housing and rapid rates of price appreciation. In the cities of Atlanta, Cleveland, and Philadelphia, median housing prices range from $60,000 to $250,000, initially suggesting widespread affordability. However, housing actually remains out of reach for many residents. Further, in many areas within each city, renewed demand and corresponding investment threaten to gentrify neighborhoods (i.e., increase real estate prices) and reduce the availability of unsubsidized affordable units, also known as naturally occurring affordable housing (NOAH). 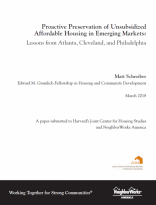 This paper seeks to answer the question of how policymakers and mission-driven organizations can get ahead of real estate price appreciation and proactively preserve the vulnerable affordable housing stock.